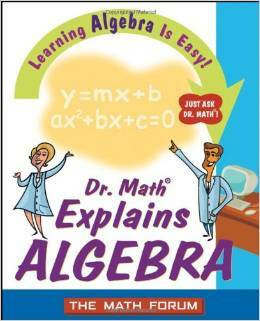 The books Dr. Math® Gets You Ready for ALGEBRA and Dr. Math® Explains ALGEBRA are meant for pre-algebra and algebra students, respectively. Both books are written in a very easy-reading style, with some cartoons in between. They are not meant to replace your algebra book, by no means, because they do not contain any exercises. The Dr. Math® books are supplementary to your existing textbook, but they are GREAT! I'll explain below why I feel that way. I truly enjoyed reading through the books. They're written in a warm, easy style – almost light-hearted at times. The text reads like a person talking to you in a friendly way while explaining math. And the layout is very clear. This is because Dr. Math® books are compiled from the best answers that real math teachers and tutors (the "math doctors" at Dr. Math) have written to students' questions over the years at the popular Dr. Math® website provided by the Math Forum @ Drexel. So it's like reading personal letters that explain algebra. Since the answers are from various "math doctors," you get to hear from many good teachers in one book. These experts touch on math history in their answers and don't avoid philosophical questions either. And while the questions are all different, you'll often read explanations of same concepts or terms in the answers. This, I think, is a richness: you get to learn the same term or concept from several teachers with various wordings. The editors Suzanne Alejandre and Melissa Running and other Math Forum employees have then tied the question-answers together by providing some basic explanations of the topics in between, FAQs that summarize facts, plus added the wonderful cartoons made by Jessica Wolk-Stanley. Before you read further, I also want to emphasize that you WILL get great value versus the price from these books: you get them for around $9-$10 at Amazon.com ($6-7 used) (or both for about $20) - nowhere compared to the price you probably paid for your algebra textbook! The books are fairly concise (around 170 pages and the font is not tiny) and read so smoothly that they are excellent review AND overview material. The size and layout of the books can make algebra seem less intimidating. About the only complaint I have is that inequalities are omitted from these two books – maybe for lack of space? I feel "Dr. Math" SHOULD explain inequalities in these books as well – he does such a good job with the other topics! Please read on for separate descriptions of both books. Fundamental Operations introduces algebraic thinking and answers questions such as, "What is algebra? ","How do you start to think algebraically? ", "How come when you use a variable in a problem sometimes the answer still has a variable and you cannot get an actual number answer?" I LOVE the way Dr. Math® tackles also the philosophical questions that students can come up with. This chapter also explains exponents, large and small numbers, and distributive property. Especially delightful was the FAQ on large numbers and infinity - infinity is somethign fascinating, yet not usually explained in such a clear but concise way as in this book. Integers starts with coordinate graphing, and explains adding & subtracting integets with usual illsutrations. 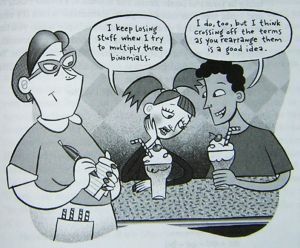 BUt I was especially impressed by the section on multiplying and dividing integers. It had several different ideas or illustrations for explaining the rule (negative) × (negative) = positive. The text also included the notion that mathematicians have had to make (-1)(-1) = 1 basically because that's the only way we can make everything else work. This book is not trying to make you just "swallow" a rule without justifications! 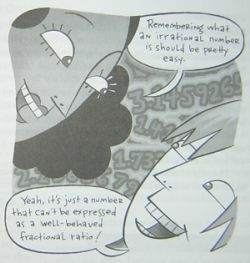 Real Numbers tackles rational and irrational numbers, square roots, pi, and prime factorization. You will be especially interested in knowing WHY 0.999999.... = 1. The chapter has a nice Venn diagram about real numbers. Equations with Variables has several questions/answers on solving linear equations of various types, plus how to graph them. The basic techniques of what you can do to equations get repeated several times in the examples, and Dr. Math even answers "How do you know what the next step should be?" or "Why can you subtract one equation from another?" The chapter also briefly covers graphing equations, though this topic is studied in much greater lenght in the other book Dr. Math® Explains Algebra. Algebra Applications is the last chapter, including ratio and proportion, area and perimeter (briefly), distance, rate, and time problems, and rate of work problems. In Linear Equations I liked the discussion about the difference between 'equation', 'function', and 'formula'. Section on slope and intercepts flows along really well with the various questions/answers delving further into the subject little by little. The chapter ends with problems about graphing. Systems of Equations is a concise chapter with examples of the various methods to solve simultaneous equations. Reading through it gives you a nice quick overview of this subject. Dr. Math also answers which method for solving a system of equations is the best. Polynomials has examples on simplifying, adding, multiplying, and dividing polynomials. Dr. Math answers the questions clearly, and the text is very easy to read. I feel that reading through a whole chapter can give you an excellent review or overview of this topic - and without getting too lenghty or boring. Remember the book does not contain exercises or practice problems. Factoring is a very important topic in Algebra 1. Dr. Math first explains prime, composite - and square numbers! (Did you know the interesting pattern found in squares of integers?) Then follow questions and answers on finding the GCF and LCM, factoring polynomials, and using the difference of two squares. All steps in the problems are explained in detail – it is like listening to a teacher explain what all is done and why. In short, the material here is excellent, and could go long ways in studying factoring even without any other book. The last chapter is Quadratic Equations. Here the emphasis is on solving the quadratic equation by factoring; however all the other methods - graphing, taking square root, completing the square, and the formula - are explained too, albeit some of them rather briefly. I would have liked some more emphasis on graphing the quadratic equations here (and less on solving them by factoring, perhaps). The relationship between the roots and the zeros on the graph needs to be well understood for further algebra and calculus studies. Then again, maybe 'Dr. Math' will later write a book for Algebra 2 and take care of that. Dr. 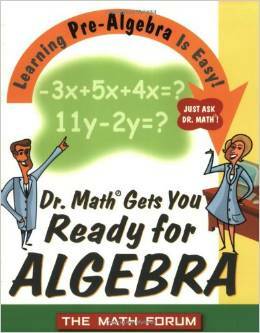 Math Gets You Ready For Algebra and Dr. Math Explains Algebra by The Math Forum. Prices around $9-10 per book, or $6-7 used.